Pierre-Emerick Aubameyang is known for his elaborate goal celebrations but the Arsenal striker needed some extra help from Letitia Wright to perfect the Wakanda Forever handshake. 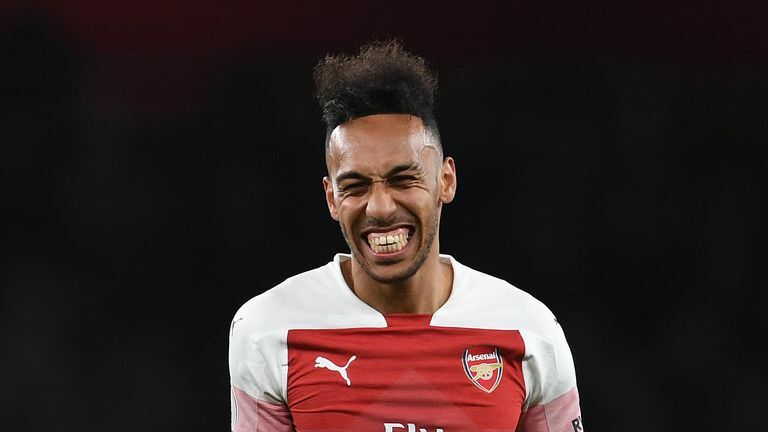 Aubameyang linked up with the Black Panther star on Monday night after helping Arsenal to a 2-0 win over Newcastle at the Emirates. Aubameyang famously donned a Black Panther mask to celebrate a goal in the 3-0 win over Rennes in the Europa League last month. However, the Gabon international struggled to get his timing right when attempting to perform the Wakanda Forever handshake with Wright. Eventually the pair mastered the move after a number of attempts and Wright later took to social media to thank Arsenal for arranging the meet. She tweeted: "After seeing @Aubameyang7 put on the black panther mask after scoring. I had to head down to @Arsenal to check out the game. "Happy I did! Really enjoyed it!" Arsenal moved above north London rivals Tottenham into third place in the Premier League with their win over Newcastle. The Gunners next face Everton at Goodison Park on Sunday, live on Sky Sports.